I wonder what Tobi could be referring to there in Panel four? Maybe someone might stumble upon it in the comments section below today’s blog post? 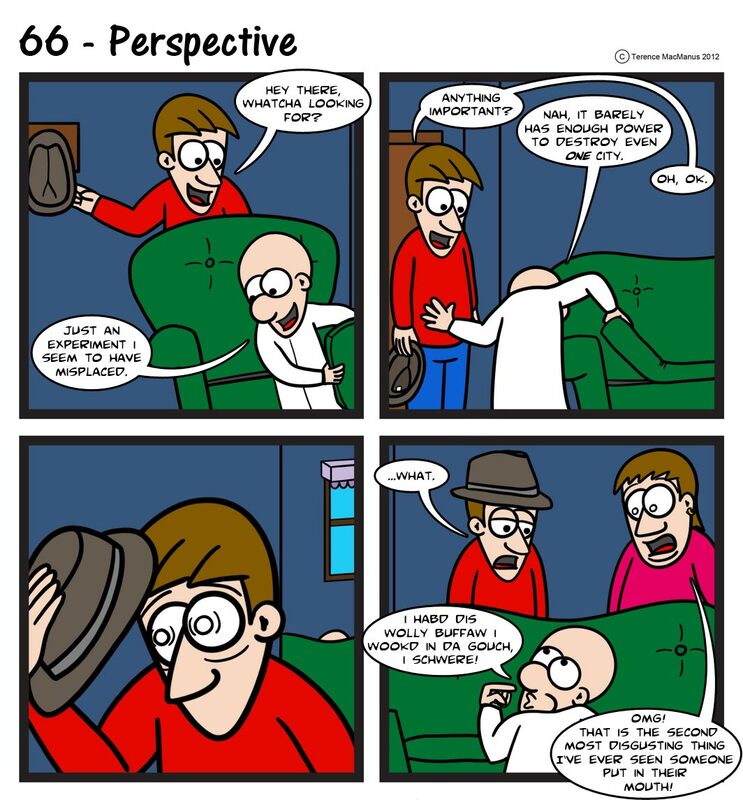 So we’re back in story time this week; this time we’re being told a story by our favourite mad scientist rather than Joe Haven’t said it today, but Wednesday’s strip will give a bit of an indication how much time has passed between the last story flashback (Strip #60 – Boundaries) and the one we’re into now. Suffice to say that a bit of time has passed between the two, bringing the time period of the flashback a bit closer to the present day, and the events of Strip #1. In other news, today I have finally departed with a rather unwelcome house guest – The moustache which had been annexing my upper lip has been forcefully evicted. It was all worth it in the end though, with donations to the hairy interloper reaching a total of $207. Huge thanks to everyone who donated, and a massive shout-out to the St. Paul’s Anglican Church community, who donated a great deal of that total. It’s not too late to get on board though! I encourage everyone to take one last trip to the AverageMo MoSpace and check out the photo of the finished product, and maybe throw a few more dollars towards the very worthy causes of Beyond Blue and Australian research into Prostrate Cancer. Now that my upper lip is shivering with cold again, I’m looking forward to getting Joe out of the house for another adventure! Tune in on Wednesday to find out where the scientist may have left his mysterious experiment of mystery!